New "soldiers of fortune" will be coming to television. Deadline is reporting that 20th Century Fox has hired writer/producer Chris Morgan (Fast & Furious franchise) to create a modern day spin on the popular '80s TV series The A-Team. Tawnia McKiernan, daughter of the late Stephen J. Cannell who created The A-Team, and executive producer Albert Kim (Sleepy Hollow) are also attached to the project. 20th Century Fox owns the rights to Stephen J. Cannell's shows and no network has been attached to the new series (original aired on NBC.) According to Deadline's report, the new A-Team would "revolve around a diverse team of American special forces operatives... (and) would include both male and female members. It’s described as a fun episodic mission-of-the-week show that mixes big action-adventure sequences with compelling characters, inventive cons and lots of humor." I'm excited. I actually enjoyed the reboot movie and thought it was quite fun. As long as the new show would include the old elements of car chases, shootouts, and doesn't get too serious, I will definitely watch. If it's the A-Team in name only...then don't bother. What do you think? 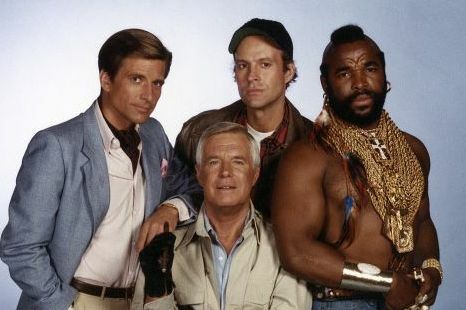 Good idea or should we keep our memories of The A-Team in the '80s?